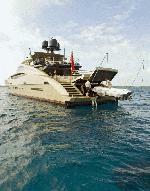 Description: The dramatic 150' model is a further progression of pure Palmer Johnson power and prestige. Her aluminium hull and superstructure ensures speed and agility whilst carefully constructed curves ensure the wheelhouse is a mere extension of her sleek sporting lines. At nearly 46 metres, the 150 continues the trail blazing appeal of her smaller sisters.